Glass plates, serving plates, place plates, glass vases and bowls. Serving plates and platters, imposing vases and bowls. Platters and Platzteller play an important role in interior design for both social in the hospitality industry. Decorate motifs by Gustav Klimt their transparent and decorative lightness, thereby creating an exclusive table decoration. The specialized trade needs her as well as the museum shop, hotels as well as resorts or SPA. Above all, the latter create the areas for their varied offer in addition to the hotel business of wellness, culture and sports. The decorative plate with the water snake motif by Gustav Klimt is almost inviting for the pool area. The operators of such hotels attach great importance to the exclusive presentation of their services (food, drinks or desserts): The glass plate with memories of a great artist combines usefulness for such customers with culture-saturated quality. Gustav Klimt motifs on glass plates. They are large glass plates , which offer themselves as representative design elements on the table. On top you will find fruit or precious drinking glasses for Prosecco, Champagne and other pleasure drinks. For example, the motif " Expectation " by Gustav Klimt is a wonderful allusion to the pleasure that awaits the guests. Make your customers aware that this glass art works well on the desk. Small indispensable business items such as business cards, paper clips or glasses cases find their place here. 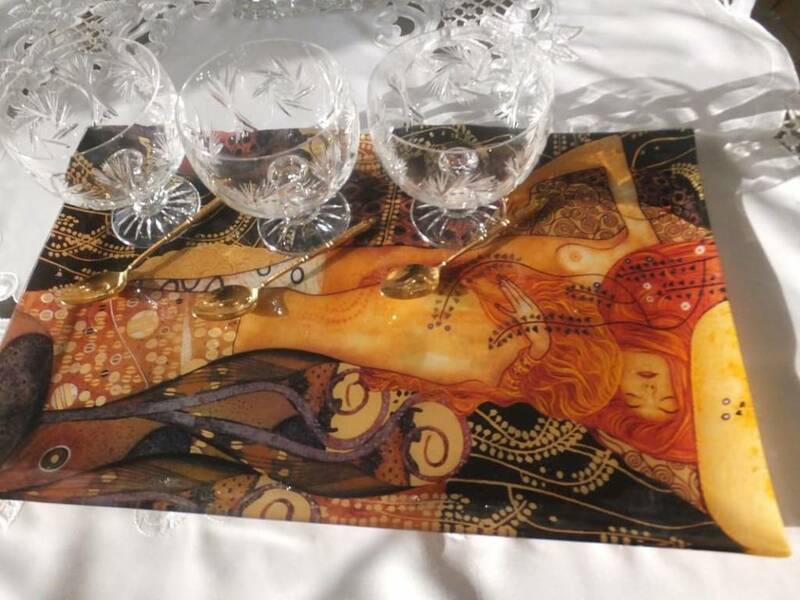 And if you already own the exclusive coffee cup with a Gustav Klimt motif, you deliberately supplement it with the said glass plates or serving plates with an idea from the same artist: simply stylish and irresistibly elegant.